Students will learn to observe habits, patterns of thinking, and movement. They will gain the ability to make changes and think critically about what's necessary physically, mentally and emotionally, specifically while practicing as a Massage Therapist. Students will identify their individual needs for balance and investigate creative tools to develop a personalized self-care plan. Upon completion, the caregiver will have a varied set of skills to use during and outside of sessions. This course is dividedinto three sections that will help practitioners develop personalized self-care strategies that assist in embracing the learning curve associated with becoming a caregiver. Introduction to a variety of meditation / mindfulness approaches, followed by a sound bath meditation presented by Lynda Arnold. Integrating athletics and body awareness as a tool for self-care as a therapist. Cultivating the mind-body connection. Learn specific yoga asana that are good for the massage therapist. Take home joint and self massage techniques to stay empowered and vital in your practice. Highlights the basics of health and nutrition for the practitioner, including why it is important to cleanse. In this course, students will learn the basics of nutrition and how to care for their bodies mindfully, integrating their own intuition. Learn nutritional essentials for daily supplementation as well as information on different techniques to cleanse the body and, foods and other approaches to wellness. 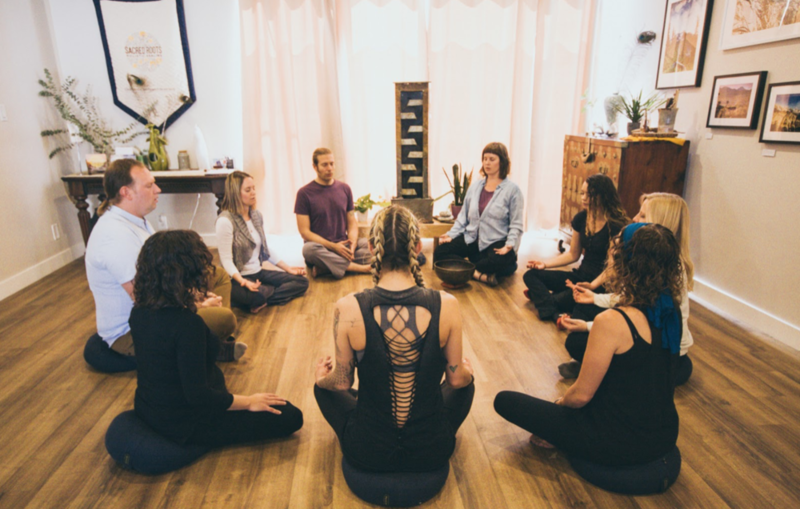 In this class students will explore intuition, meditation, and reiki as tools for self-care and practice. Introduction and inquiry into into guided meditations & imagery, intro to the seven chakras, use of a variety of corresponding crystals, Level I attunements and exchange with students. Application of Mustard Seed Foot bath followed by self massage and reflexology therapy.